Chinese wood mushrooms are used for cooking roast and stewed dishes – side dishes, salads, appetizers and soups. They are widely distributed in China, Thailand and Vietnam. In our stores they are sold in a small box and have the appearance of thin, brittle and charred paper. Soak mushrooms, in this case, note that after that they will increase in volume about 10 times. So take appropriate a large pot with a lid. Usually 1 box of mushrooms absorbs 300 milliliters of water. Fill the mushrooms with warm boiled water. Let stand at room temperature for 2-3 hours under the hood. After that, you will see that the water in the pan will be a huge pile of black shiny mushrooms. Now pour the mushrooms conventional cold water, cover, and refrigerate for 20-24 hours. After that the mushrooms wash, sort, cut away the mounting location of the mushroom petals. Too large ones cut into 2-3 parts. Place in a colander and leave to drain the water. Smoked or cooked chicken cut into strips. Cucumbers kb,j cut into strips or grate on a coarse grater. Carrots grate and fry with the finely chopped onions in vegetable oil. Can put it in salad and raw. Mushrooms saute with the onions or separately if you fried onions with carrots. Funchoza boil, drain in a colander and allow to cool slightly. Whisk 2 eggs with 1 teaspoon of starch. 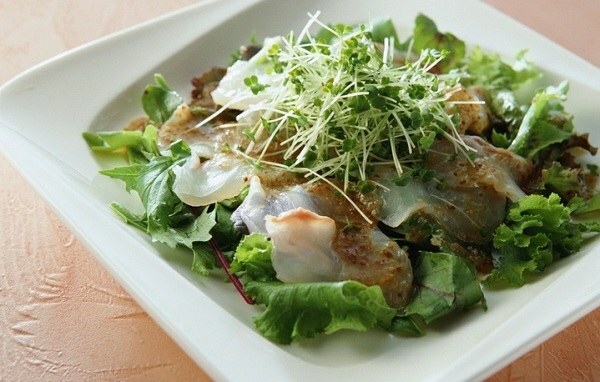 In vegetable oil bake pancakes, cool and cut into strips. Put all ingredients in a deep salad bowl. Pour soy sauce or salt, pepper, moist sprinkle small amount of sugar. Squeeze a few cloves of garlic. Mix thoroughly. If necessary, season with vegetable oil or soy. Put on 2-3 hours in the fridge to infuse the salad. Chinese wood mushrooms in a dry form can be stored in a cool place. And the shelf life of soaked mushrooms in the fridge is 2-3 days, however, they must be in a bowl of water with a lid.